After the burst of summer weather last week the red currants ripened to their glorious translucently scarlet selves so today I picked them before the blackbirds found them. In fact, the ones I picked were from a self seeded bush that I've been nurturing on the end of what is becoming a lavender bed. It's quite open around it at the moment which is a great benefit for keeping birds away - the red currant in the back garden surrounded by tall weeds and suckering raspberries is almost stripped bare already. Anyway, I have double the quantity I'd estimated and must turn them into a few little pots of jelly for the winter. Insect life was ramping up, then slowed right down again for the last two days by overcast and windy conditions but mostly they're making sweet love while the sun shines. 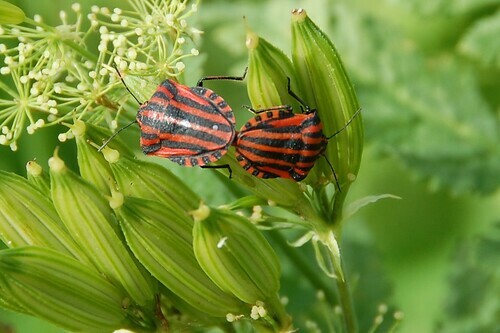 The striped shield bugs Graphosoma lineatum have been in congress all over the Sweet Cicely for some time now. We've seen a few stray less common butterflies, just one Pale Clouded yellow on the 13th June and a summer Map along with the first few examples of the meadow browns.The wind has been in the north for about a week now which tends to discourage exotics migrating up from further south on the continent. I will try and do a few posts to summarise the vegetable plots in the next few days. A statement of intent like that sometimes works but often ends up being a trigger for guilt when I fail to make the effort. We'll see, things are looking fairly good and worth reporting on. Those striped shield bugs are so photogenic.